By all accounts, the California life science industry is flourishing as one of the leading employers in the state, providing work for more than 280,000 professionals from the entry-level to the c-suite. Demand is outpacing supply, and job opportunities are plentiful—though they aren’t always easy to land. 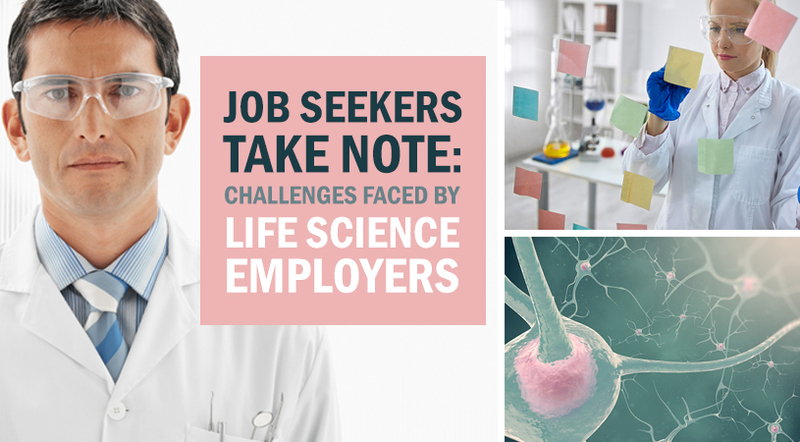 BioSpace recently spoke with executives from the California Life Sciences Institute (CLSI), Biocom Institute and San Francisco Bay division of the Centers of Excellence about the recruiting and hiring challenges facing the state’s life science employers. Their responses were illuminating and may contain information job seekers can put to use when preparing for their next life science position. 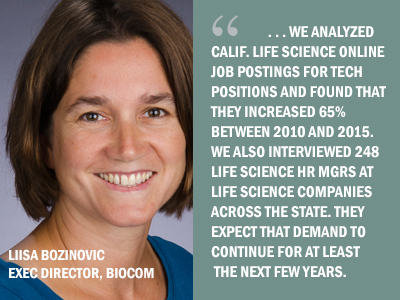 BioSpace: How would you describe the life science job market in California? The life science industry continues to be a strong economic driver for the state. For our recent 2016 California Life Science Workforce Trends Report, we analyzed California life science online job postings for technical positions and found that they increased 65 percent between 2010 and 2015. We also interviewed 248 life science HR managers at life science companies across the state. They expect that demand to continue for at least the next few years. We know there are thousands of job postings for entry-level life science jobs across California that are going unfilled right now and have been that way for the last few years. There’s a lot of demand out there that just isn’t being met. BioSpace: Why do you think employers are finding it challenging to fill these life science positions? In the conversations with life science employers we had when preparing the workforce trends report, we learned that one of the reasons is competition with tech and other industries for top talent. Additionally, several executives pointed to the public’s perceptions of the industry’s responsibility for the rising cost of health care. They feel there are a lot of misunderstandings, misperceptions and a general lack of awareness about life science industry opportunities. Finally, they also mentioned the lack of a diverse talent pool in terms of race, gender, ethnicity and culture. There’s real value in having a diverse team both for cultivating an array of perspectives and approaches to fuel a vibrant organization as well as for communicating and partnering in a diverse global market. However, they’re having a difficult time finding this diverse talent, particularly given the weak pipeline of women and minorities in the field. Carrese: When it comes to entry-level or middle skill positions—those that require more than a high school education but less than a four-year degree—there’s a huge gap between supply and demand. We have about 27 community colleges across California with life science or bioscience programs. Each year, those programs supply about 420 graduates. However, in 2013, there were about 3,300 job postings for middle skills jobs. Additionally, a lot of employers are looking for candidates who have four-year degrees and may not know that community college graduates from these life science programs are absolutely qualified to fill those entry-level middle skills jobs. BioSpace: So it sounds like competition, perception and shortage of qualified candidates—or candidates they perceive as qualified—are the biggest challenges. What are employers doing to address them? Bozinovic: We found that some employers who can’t find the talent they need locally or even nationally are looking to the global market. When we surveyed 248 HR managers for our report, we found 27 percent of their companies were employing H1B visa holders. In general, the number of employees with H1B visas went up in conjunction with the size of the company. Employers also talked to us about the need to better share the positive impact the life science industry has on the world. It’s full of dynamic, interesting careers where you’re always surrounded by passionate people who are making a difference. Many professionals get into life science because they want to be part of a cause. The more that message gets out there, the less of a challenge public perception will be. Lindburg: We found several life science employers who recognized the value of partnering with academic programs at all levels from secondary and post-secondary on up to post-docs when developing a talent pipeline. They work with those programs to co-develop the talent they seek by providing students with real world practical opportunities to obtain that industry relevant knowledge. Of course internships and mentoring are fabulous for that, but there are also other ways the industry is working closely with programs to expose students to career professionals such as through career talks, informational interviews and the outsourcing of backburner research projects to students. In terms of diversity, we’re hearing about many more employers recognizing the importance of getting involved with schools very early to get more females and underrepresented minorities familiar with and excited about STEM. Companies are finding a great hiring pool in these academic collaborations. 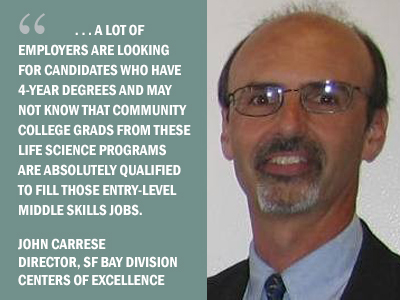 One big bay area employer told us they are getting one third of their hires by offering internships at the high school and community college level as well as for MBA candidates and post-docs. BioSpace: Your 2016 California Life Science Workforce Trends Report found that most life science positions in California require at least a four-year degree and three or more years of experience. Do you think more employers should consider new grads and entry-level candidates? Lindburg: From where we sit at the institutes connected with our trade associations, yes. We work closely with some really outstanding and even nationally recognized community college programs that are training students for biotech certificates, to be lab assistants and lab technicians, and to work in bio manufacturing, stem cell research and genomics. These programs are excellent; they really emphasize hands-on training and many of them have industry professionals on board as adjunct faculty. Anecdotally, we’ve heard about a lot of students with four-year degrees who are going back to these community college programs to get the sort of hands-on training that employers are seeking. 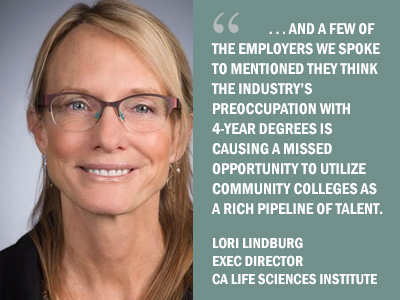 And a few of the employers we spoke to mentioned they think the industry’s preoccupation with four-year degrees is causing a missed opportunity to utilize community colleges as a rich pipeline of talent. Check out the latest Career Insider eNewsletter - July 28, 2016.